Set amid the oceanic expanse, All is Lost is anything but a survival movie, for many reasons. Nevertheless, mortality is very much at the film’s heart, which beats to the rhythms of despair and redemption. This one-man show is both affirming and bracing, a reminder that even the best of the human condition is fragile and fleeting. 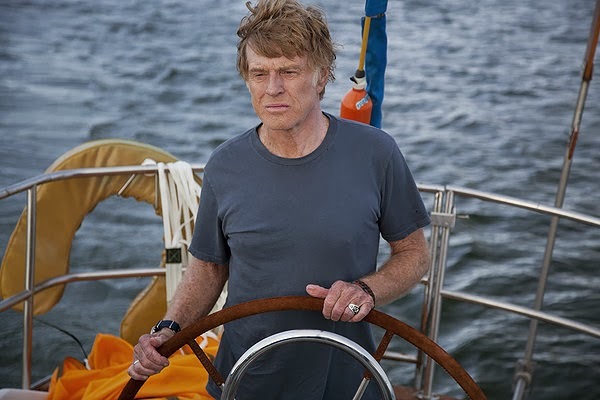 It’s revealing that the film’s lone character, portrayed with extraordinary minimalism by Robert Redford, is credited as “Our Man.” He embodies our collective best traits: brave, intelligent, independent and resolute. But ultimately, he’s just a man. In the opening scene, he awakes in the middle of the Indian Ocean to see that water is flooding into his sailboat, “The Virginia Jean,” its hull punctured by a stray metal shipping container full of tennis shoes. The striking thing about Our Man is that he doesn’t believe that all is lost. Instead, he a calm, sober seafarer, inadept with a sextant but adaptable to employing it and other survival solutions, from painstakingly spreading homemade epoxy to seal the boat’s breach to navigating into shipping lanes to attract the help of passing ships to converting a gas can into a condensation collector for drinking water. Along the way, he must constantly decide when and when not to abandon various vessels, along with other difficult choices driven more by discernment than emotion. Filmed in the same studio water tank where the movie Titanic was once made, All Is Lost is narratively a cross between Cast Away and the visceral Open Water. But, for all the film’s storyline sparseness, it is a thematic Rorschach Test. At the forefront is a parable on mortality, how all of one’s knowledge, experience and preparation are no match for life’s storms and death’s inevitability. And what better vehicle to use than the 77-year-old Redford, long a paean to eternal cinematic youth, deconstructed here from a confident, independent soul to one enveloped by desperate madness. There’s spiritual and biblical connotations at play: the aquatic milieu suggests Jonah, but Our Man’s plight is more evocative of Job. Squint and you’ll also see a subtle commentary on the marginalization of individuals in our sea of capitalism. Besides those destructive sneakers, there’s the striking image of Our Man juxtaposed against a passing Maersk freighter filled with hundreds of the same containers that disabled his boat eight days earlier, his cries for help too miniscule to divert the commercial colossus. This sophomore feature by director J.C. Chandor explores with a different sort of survival than his promising debut, Margin Call, which dealt with the Wall Street meltdown. Nevertheless, a similar feeling of hopelessness is at play. All Is Lost isn’t an exclamation of surrender; it’s a recognition of life’s reality.